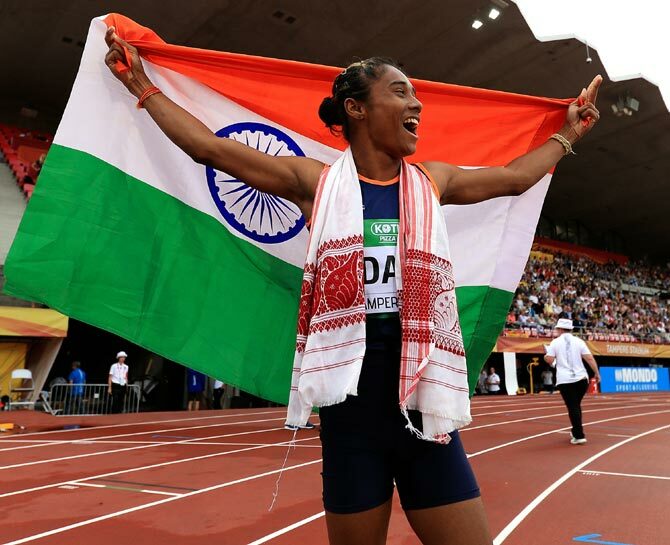 Most of you might now know who Hima Das is and what her achievement is. But do you know how much it took her to achieve this level of success? From being into rice fields to International running track and winning it, Hima has made every Indian proud. But, who is she? Well, Hima Das is the First Indian Woman to earn Gold Medal at world level in track event of 400m Final race in World Under-20 athletics event, IAAF (International Association of Athletics Federations) making India proud and creating History. She completed the race in 51.46 seconds. None of the Indian Sprinters from any Category has won Gold medal at World level event till now. Let us pause the event and come back after taking a look at the journey that has brought her here. 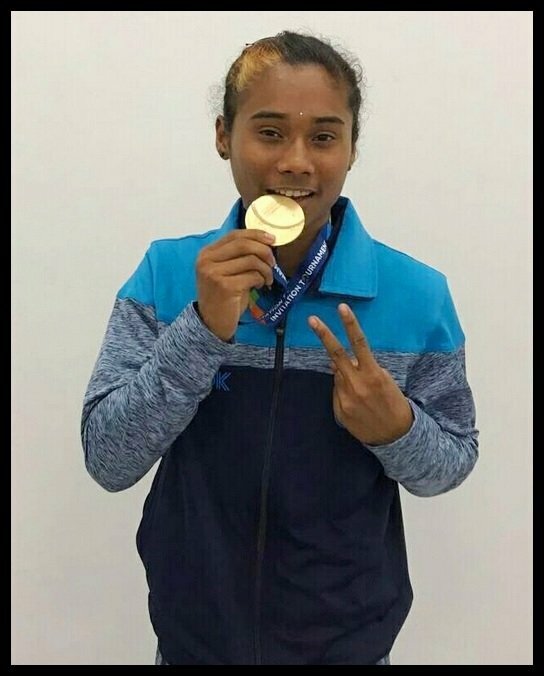 Hima Das was born on 9th of Jan in 2000 to a poor Farmer family to Ranjit Das and Jonali Das, residing in Dhing village, Nagaon district of Assam state. Her childhood has been spent in the rice fields and she is the eldest of three children of her parents. For a girl, a normal childhood mean, playing with dolls, helping parents etc. but Hima was different. How? She was active since her childhood days as she used to play football mostly with boys of her area in a mud pit near her father’s rice field. Hima was studying from her locality and was to appear for her final examination for 12th in arts stream but couldn’t due to her participation in Commonwealth games. So, how does the journey of young athlete started? Well, it started hardly 2 years ago. For a girl who began taking participation in events just 18 months back and bringing a gold medal for India speaks about her talent loudly. Hima has made it to the sports camp by winning many state-level and district level Junior Athletics Championships from 2012. But the credit for her winning those goes to Shams Ul Haq, a teacher of Jawahar Navodaya Vidyalaya in Assam who spotted her talent when she was at his school for a sporting event. It was Shams, who made her take up athletics seriously or else she would have continued playing football in the neighbourhoods of Dhing sprinting among the boys. During an inter district meet, Hima met her now coach, Nipon Das, Directorate of Sports and Youth Welfare. He was very impressed by her running skills. Nipon, the diamond finder asked her to shift to Guwahati, 140 km away from her home so that he could train her for international events in the Sarusajai sports complex. As we rewind to May 2017, we could see Nipon Das looking at a gasping Hima in surprise with the clock in his hand paused at 57 seconds. The reason for his surprise is that this is the first time the girl has run a 400 meters race and she has clocked 57 seconds. Her previous checkpoint before Tampere was Gold Coast in April. To our surprise, the young girl is starting the 400 m finals at the Common Wealth Games, but to our dismay, she could only manage a sixth place. That’s ok, there is still another event for the girl, the 4×400 meters relay, but yet another time the team couldn’t make it and finishes seventh. But an 18-year old girl competing in a CWG event finals is quite a big achievement. Every Indian had a question in their mind? So who is this girl and where is she from? 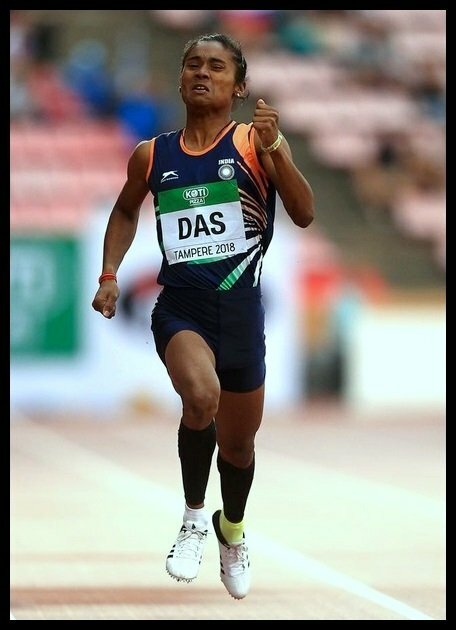 Yes, she is Hima Das, the first Indian woman Athlete who have made India proud by earning Gold Medal in Junior athletics events. She garnered huge respect when tears flew down while the Indian National anthem was being played at the event after her win. 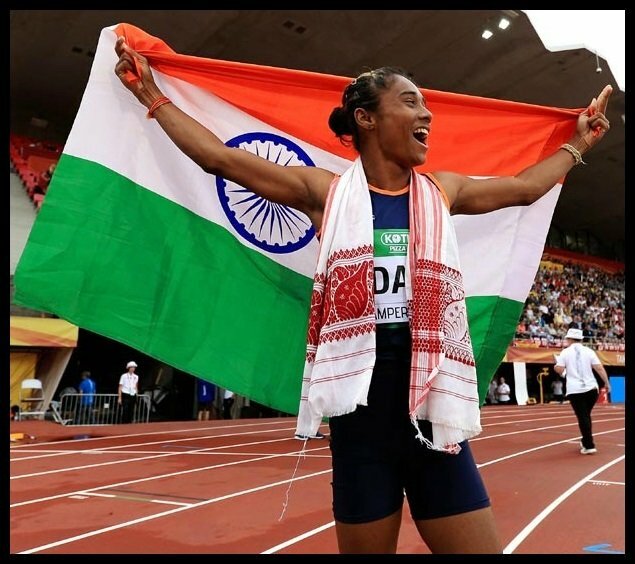 Hima Das is famous for being the golden girl, but for Nagaon district, she was a hero from before. Hima knew what is good and bad at such a young age and demolished all liquor vendors and stalls in her village, Dhing. She did this by protesting and demolishing them. She is fondly called as Dhing Express in her area. Not only she has inspired young girls to achieve their dreams but has also inspired everybody to speak against illegal things and be socially conscious as well. Hima Das has made India proud and Government of India has announced full support to Hima until her next major event, 2020 Tokyo Olympics. After the 2018, Olympics event, Hima along with other runners were sent to Spala Olympic centre training situated in Poland for training and now she is gearing up for 2018 Asian games. She is focused on bringing more medals for India. This girl from the village of Dhing, born in an agricultural family, without years of training and high-end facilities has made history sowing hope into every aspiring young athlete. Persistence guided her to the port of success sailing through storm and rain and she became the First Indian Woman Athlete to bring gold to India in track event. Thanks to the gentlemen Shams Ul Haq and Nipon Das who could not resist themselves from showcasing such a talent to the world. We are sure you would now know all the unknown facts about our Golden girl, Hima Das. What do you think about her journey? She have surely inspired many young girls. Do let us know what do you think by commenting below! !